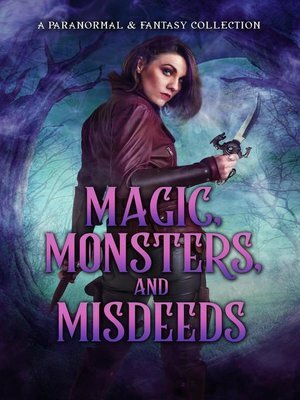 Magic, Monsters, and Misdeeds. 8 wild romances for the wicked at heart... Each story will leave you both enchanted and enthralled as it weaves magic, introduces monsters, and uncovers misdeeds that will leave you with a smile of satisfaction. Lauren Smith Mikhail: A Royal Dragon Romance - Gemologist Piper can't wait to bury herself in her newest project, evaluating a hoard of Elizabethan-era treasure. But both her life and career are threatened when a mysterious man with a dangerous smile—and a seductive kiss—snatches the lot. Mikhail, isn't an ordinary jewel thief. He's a Russian Dragonshifter who can't resist kidnapping a tempting virgin like Piper who loves sparkling jewels just as much as he does. But can he keep her safe from his enemies? Rebekah Lewis Under the Satyr Moon: A Cursed Satyroi Novel - Ariston has searched the globe for a nymph to free him from his curse, but over three thousand years of failure has pushed him into a life of solitude. Ariston believes he's finally found the salvation he's longed for when he catches Lily spying on him in the forest. Unfortunately, what seems to be the Fates bringing them together in time for the Satyr Moon proves to be an elaborate scheme with macabre intentions. Elizabeth St.John The Alpha's Dove - Shift into a world of passion and looming betrayal. Newlyweds and Alpha pair, Markus and Delila have an undenyable passion. They are tied to one another so deeply that when someone threatens their way of life, it nearly ends them both. Dawn Brower The Enchanted Princess - Elodie is a princess. A curse is enacted sending her to the nightmare realm of Malediction—sweeping her, a trusted guard, and a prince into its dark clutches. Escaping the world is impossible, but if they don't find a way out they could die. Aubrey Wynne Saving Grace - Chloe Hicks' life consisted of an egocentric ex-husband, a pile of bills, and an equine business in foreclosure until a fire destroys the stable and her beloved ranch horse. She escapes the accusing eyes of her hometown, but finds another kind of haunting. The legend of Grace, accused witch, is eerily similar to Chloe's accusation of arson. Can the past heal the present? Nicola M. Cameron Red Robin and the Huntsman - Captain Duncan Bardahlson's hunt for a wily bandit takes an unexpected turn when he runs into his childhood sweetheart, now the widowed countess of an impoverished province. Can Duncan catch the bandit and win back the only woman he's ever loved? Diane Rinella Moonlight Serenade - When Dale seeks the help of a wine-loving psychic, he has two things on his mind: "Where is my dream girl? And why is a ghost following me?" Five hundred dollars later, he has a cryptic clue and a song stuck in his head. Bailey's sleazy boyfriend has her over a barrel. She will outfox that snake and escape his hold—even if it means diving into mischief. Will a long-sought opportunity lure Dale off course? Or will otherworldly intervention get him and Bailey dancing cheek to cheek? Leona Bushman Daryn's Slayer - A slayer and a vampire pair up and turn the supernatural world inside out. Daryn falls instantly in love with Ernestine the moment he meets her, despite her calling as a slayer. Ernestine, a werewolf without the ability to shift, can't deny the desire he inspires, even though her life's work, her every breath, focused on ridding the world of the evil vampires. Together, their powers change into something new, and their mating becomes a beacon.